NEW YORK, New York — Through the bequest of the renowned Armenian-American painter and sculptor Varaz Samuelian (1917-1995), the Hayastan All-Armenian Fund marked the opening of the highly anticipated Varaz Samuelian Cultural Center on September 7 in Artik, a city in northern Armenia’s Shirak Region. Born in Yerevan to a family of Genocide survivors, Varaz Samuelian would soon become an acclaimed painter, sculptor, and author after moving to the United States in 1946. His David of Sassoon, a two-and-a-half ton copper statue representing justice and freedom, is a beloved historic landmark in his hometown of Fresno, California, as well as an extraordinary symbol of Armenian identity, images of Armenian cultural history carved in granite at the base of the statue. With the opening of the $425,000 cultural center in Atik, funded by the Hayastan All-Armenian Fund U.S. Western Region and Samuelian, the artist’s dream of making his life’s work a vibrant part of Armenia’s culture has become a reality. Fully furnished and computerized, the two-story, 550-square-meter center is designed to function as both an arts establishment and a hub for community leisure. Numbering the center’s offerings are an art gallery, an events hall, and a computer room, as well as rooms for fine arts, music, and chess instruction. The hallmark of the center is its permanent exhibition of works by Varaz Samuelian, which is expected to become a major attraction for local residents and tourists alike, the donation thereof stipulated in his will. The many dignitaries and guests in attendance at the opening of the center included Tigran Sargsyan, prime minister of Armenia; Seyran Petrosyan, deputy governor of Shirak; Khachatur Varagyan, mayor of Artik; Ara Vardanyan, executive director of the Hayastan All-Armenia Fund; Ara Aghishian, chairman of the Hayastan All-Armenian Fund U.S. Western Region; Bishop Mikayel Ajapahyan, primate of the Shirak Diocese; and pastors representing the Artik congregation. In their respective remarks, the reverend fathers conveyed their gratitude and blessings to all those who have made the Varaz Samuelian Cultural Center possible. 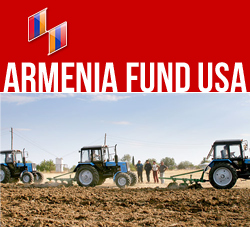 ABOUT ARMENIA FUND USA: founded in 1992, was one of the first of Hayastan All-Armenian Fund’s 20 international affiliates and serves constituents in all states east of the Mississippi. As a non-profit, non-governmental, nonsectarian organization, the Fund represents all Armenian constituents, supporting strategic infrastructure projects in Armenia and Karabakh. The Fund has adopted a policy to go “Beyond Bricks and Mortar” to provide sustainability for projects it sponsors. www.ArmeniaFundUSA.org or call us at 201-639-3985.